Fire egress is one "hot" topic! A sad record, 78 deaths in house fires in 2016. 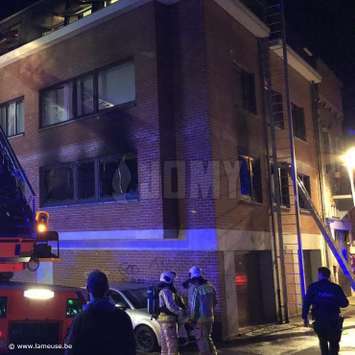 1 out of 3 Belgians never thinks about fire safety. 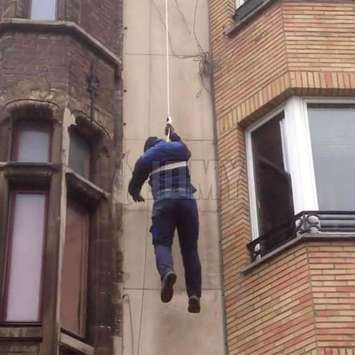 85% of all Belgian residents never thought of an escape plan. In Belgium there are every year around 10,000 house fires with several deaths, severely burned victims and consequent material damage. 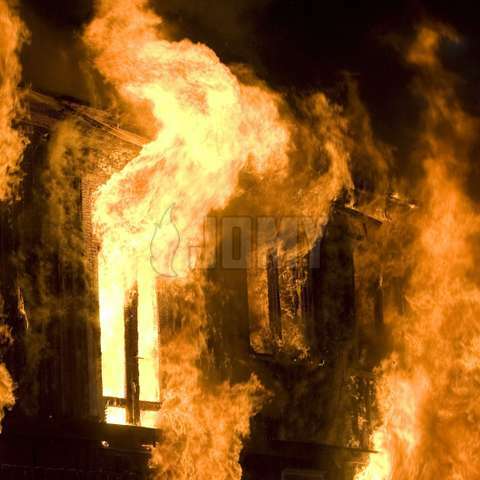 In Belgium there is one victim of a fire every 5 days. We do not spend enough time thinking about an effective escape plan. Wherever you are in a building you need to be able to escape in a safe and quick way. Once a fire starts it grows increasingly rapidly. The resulting smoke will become life threatening within minutes. Even if the emergency services arrive quickly, it could be too late to escape. Due to the many authorities having an input on the subject, the situation has become very complex. As kown well by JOMY engineers, one can always find in all those regulations some "best practices" to apply. ISO 8421-6: Fire protection -- Vocabulary -- Part 6: Evacuation and means of escape. Hereunder you will find some "best practices". JOMY does not take any responsibility concerning your personnal application of these, indeed, we strongly recommend that you check with your local authorities first. 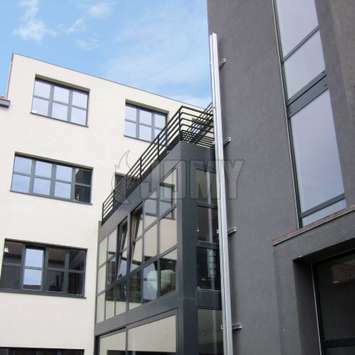 1 person per 3m² for buildings that are publicly accessible. More specific numbers apply when a fixed interior design foresees another occupation. Generally, there should be at least two independent, non-intersecting escape routes. 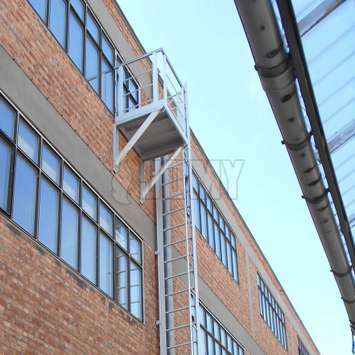 Buildings between 10 to 25m with less than 50 persons and that are accessible by the fire services's ladders placed on the street side. Even in these cases, the fire department (and good prevention) often requires a second escape route. The escape stairways should go in opposite areas of the space. The doors may never be locked in the evacuation direction. Retractable stair flights and paneling/enclosure of the lower flight are accepted. 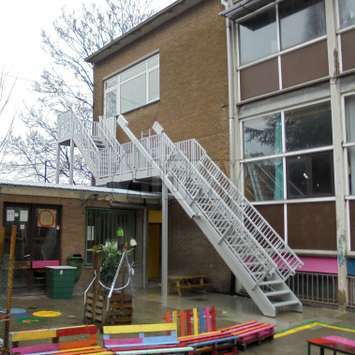 Stairs for a building higher than 25m need to allow access to the roof (when the roof is flat). The UW is determined by the number of persons to be evacuated from the compartiment at full capacity. The sum of the UW of all descending stairs has to be at least equal to the number of persons to be evacuated from the largest compartment, multiplied by 1.25cm (ΣUW = number x 1.25cm). 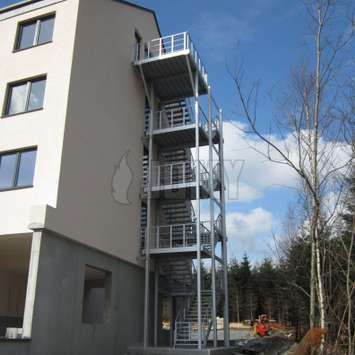 For medium and high-rise buildings (> 10m), an incline of 45° may be acceptable (confirm with authorized fire department). Sometimes, the stairs can only be used by persons with good mobility. For rising staircases, an incline of 45° is acceptable. Depending on the available space and number of persons to be evacuated, UWs of 90, 100, and 110cm may be used. In schools and daycares, a UW of 120cm is provided, even when the number of persons to be evacuated is less than 64 per compartment. Different stairs of the same compartment must have the same UW, plus or minus 60cm. The value of 1.25cm per person is only valid for descending stairs, for ascending stairs this factor is 2cm, and for flat walkways 1 cm per person. 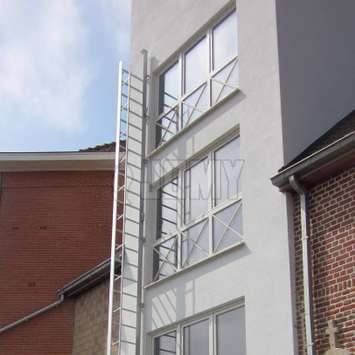 The stairs must be able to carry a uniformly distributed load of 102 lb/ft² or 500 Kg/m² on each flight (the surface projected on the horizontal plane) and on the landings. They must also support a point load of 441lb or 200Kg applied anywhere on the steps or landing deck. At least one side must permit the free flow of air. Spiral stairs are generally not advised and for tall buildings (>=25m) even prohibited. A spiral stair must have a thread of at least 24cm on the walk line, located 0.4m to 0.6m from the handrail or the spindle and at least 0.35m from the outer edges of the steps. Usually, an incline of 37° is requested (or about 75%). Inclines greater than 45° must be avoided. The tread "a" and the riser "o" must meet the following formula: 600 <= a + 20 <=660 [mm]. A stair flight may have a maximum of 17 steps. If a greater height needs to be bridged an intermediate landing has to be provided. Always provide 2 guardrails per stair. 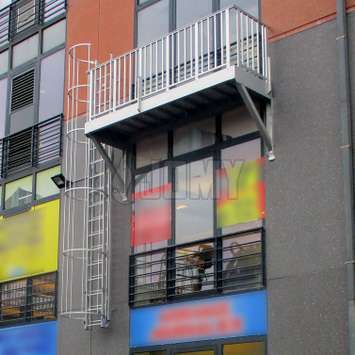 Exception: One guardrail is sufficient for stairs with UW < 120cm, low buildings (< 10m), and when there is no risk of falling. 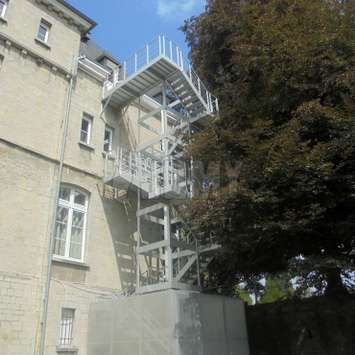 The minimum height for escape stairs is 1m on the landings and 0.9m on the stair flights, measured on the stair nose. The maximum gap between the vertical bars is <= 80mm (<= 70mm in Wallonia). There must be no horizontal elements that could be used as a step by children. Height of 1.1m instead of 1m. A second guardrail that can be used by children must be provided (below the main guardrail). Materials must be of class A0 (non-flammable material, such as aluminum, steel, or concrete). 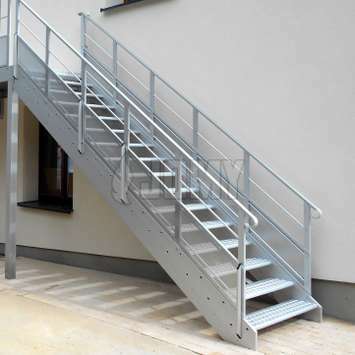 There are no fire resistant requirements for outdoor stairs. Stable materials without detoriation due to ageing. The guardrails need to be able to withstand a horizontally applied uniform load of 220.4lb or 100 Kg/m, without permanent deformation.